Absolutely nothing beats a creamy, cheesy, bubbling casserole right from the oven for these chilly winter nights. 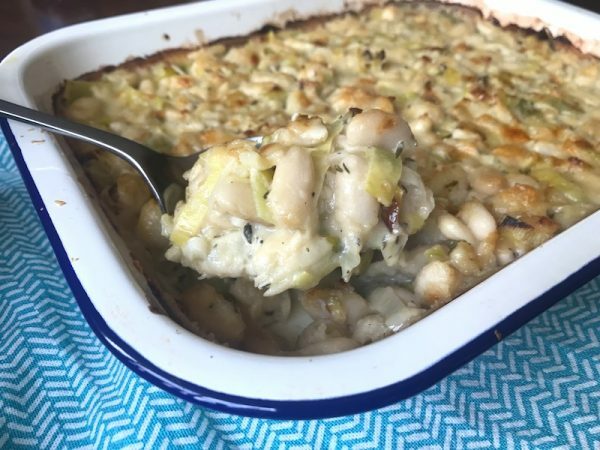 This cannellini-bean version is chock-full of sweet sauteed leeks, garlic and aromatic veg and works well either topped with breadcrumbs and parmesan (as a main) or parmesan and cracked black pepper (as a side). It’s also awesome assembled in advance for those nights when everything is chaotic and all you want to do is throw something in the oven to get dinner on the table. If you are using dried beans, don’t forget to soak them the night before! Sub the butter, cheese and cream for vegan versions, or leave out entirely – the casserole is also great made with just stock and no dairy. 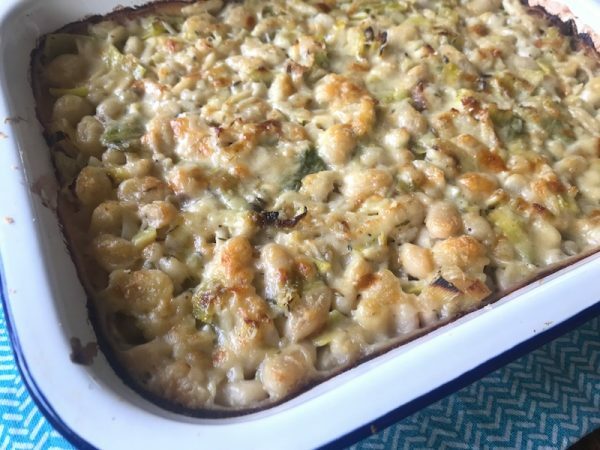 Soft white beans and sweet leeks in a savoury creamy sauce, topped with cheese and baked in the oven until bubbling - the best! Drain your soaked cannellini beans, and add to a pot with fresh cold water to cover. Bring to a boil and boil for an hour to an hour and a half until beans are soft. Top up with water as necessary. In a large frying pan over medium heat, saute the the leeks and celery in the olive oil and butter until soft. Add the minced garlic and saute a minute or two more. Add the cooked white beans (or two tins of organic bean of choice, rinsed), cream, stock, salt, pepper, and herbs. Bring briefly to a boil. Turn the heat down and stir gently until you can see the sauce thickening (cooked dried beans will have enough starch to do this, if you are using canned beans, thicken the sauce with a little cornflour). Add half the parmesan and stir to combine. Test for seasoning, and adjust as necessary. Pour into an oven-safe casserole dish and top with the rest of the parmesan. Bake for 20 minutes until the edges are bubbling, the top is browned, and the casserole is heated through.